He was perhaps the greatest gun smith of the era, known as an utter genius. His gun-smith name was Noda Zenjiro Kiyotaka. Hankei's work is rare. His group is small; his student, Hansho's work is rare and the work of Seikei almost never found. HANKEI: O-ITAME MASA which can be rough. SUGU KO-MIDARE, GUNOME-MIDARE, NOTARE, O-MIDARE with KINSUJI and INAZUMA. CHIKEI. SOSHU style. HANKEI likened to MASAMUNE. 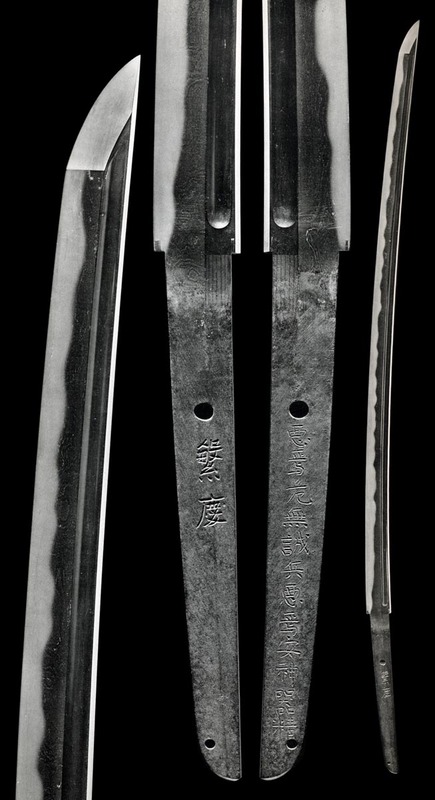 Both blade-making and signature are recognized as having an early and late style period. One source argues he was born in MIKAWA. He lived temporarily at HACHIOJI, BUSHU. His name was NODA ZENSHIRO KIYOTAKA and is also called NODA ZEN KIYOTAKA and his classic sword MEI is HANKEI. He came from a family of gunsmiths. 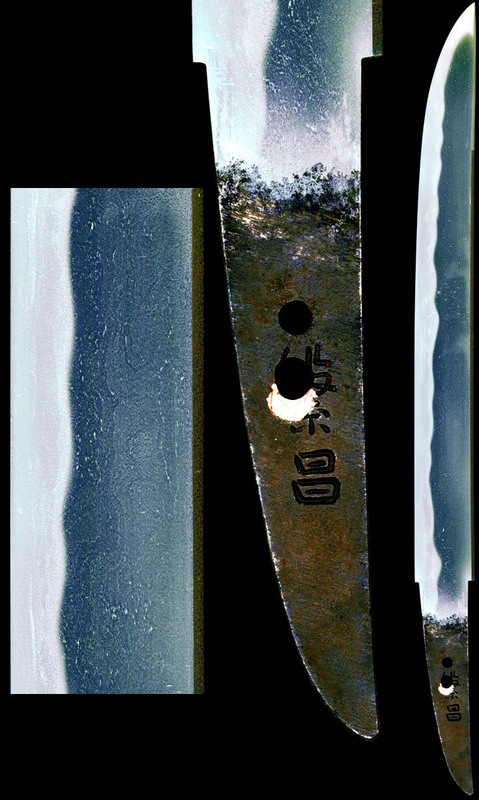 He has a unique quality to his steel, a hardness is seen in a blend of O-ITAME that runs. This appears like the famous MATSUKAWA "Pine Bark" HADA, a running appearance where wide, expanded O-HADA mixes with defined and complex, running grain lines. His steel is KURO or dark. It appears like the dark of night.His will be standing HADA with JI-NIE which has long been compared to MASAMUNE or NORISHIGE and is speculated that he not only re-created their ideal but surpassed them in taking the next steps in in their technological drive. 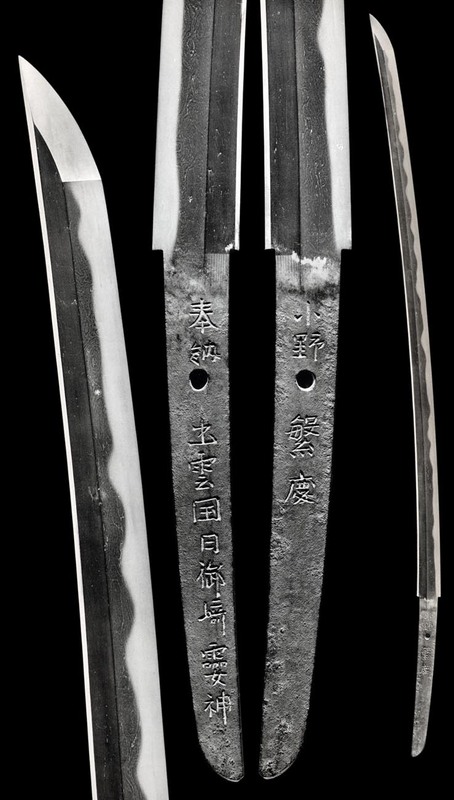 Swords signed KIYOTAKA are few and should show a an even NOTARE, GUNOME mix in NIE-DEKI with ARA-NIE that is comparatively defined and clear. NIOI-GUCHI seems defined. Swords signed HANKEI are O-MIDARE, KO-MIDARE, KO-NOTARE mixed with GUNOME HA where NIE and HOTSURE are exceptionally strong and the NIOI-GUCHI is wide. SUNAGASHI repeats wherein KINSUJI will be found. HAMON is NIE-DEKI with ARA-NIE reminding of the SOSHU style of NORISHIGE. The HAMON above the YOKOTE is wide and large in HAKIKAKE that sometimes seems YAKIZUME but mostly a long fall in a near MUNEYAKI. His large BOSHI will often nearly become ICHIMAE. His large BOSHI will often nearly become ICHIMAE. 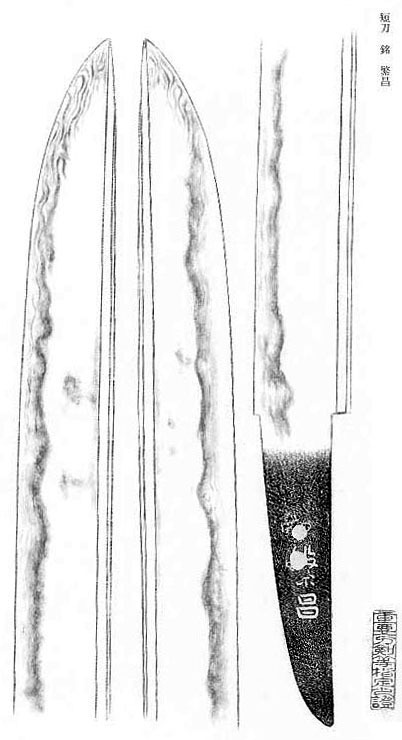 Shinogi-Tsukuri, Mitsu-Mune, shallow Sori, elongated Chu-Kissaki. Strongly standing and roughly forged Itame-Masame, Mokume Hada with Ji-Nie and twisting Chikei. Nioi-Fukashi and Nie, Midare of Gunome-Midare with Sunagashi and Kinsuji. Kaen Flame Boshi one Hakikake. Ubu Haagari Yagengata Nakago has two Mekugi-ana. In his thick, gouged out strokes. 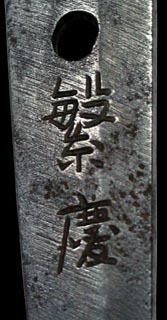 Itame Mokume, standing Hada has Ji-Nie. Rough and open in places. Notare Gunome mix in Nioi-Fukashi and Nie with running Sunagashi and many Kinsuji. Midare-Komi Boshi of streaming Hakikake. Ubu Yagengata Nakago with one Mekugi-ana. Long possession of Utsunomiya Family of Omi. Now in private hands. Itame with Masame Hada near the Mune - O-Mokume with strong Chikei stretches through Ji, having profuse Ji-Nie over strongly standing Hada. Soshu style rolling O-Midare Ba in wide and deep Nioi-Fukashi with running Sunagashi having thick Nie and Ara-nie. Deep Boshi is Tsuki-age where the Kaeri runs Naga down the back. An extraordinarily high degree of excellence. Hira-Tsukuri, Mitsu-Mune, of very slight Sori. Tsuru "Crane" & Matsu in a Frame. Running Ko-Itame Hada has Ji-Nie and Chikei. Asaki-Notare Midare Ba of Sunagashi in clear Nioi and Nie where the mid becomes Niju with long Kinsuji. Ubu Yagengata Nakago has two Mekugi-ana. 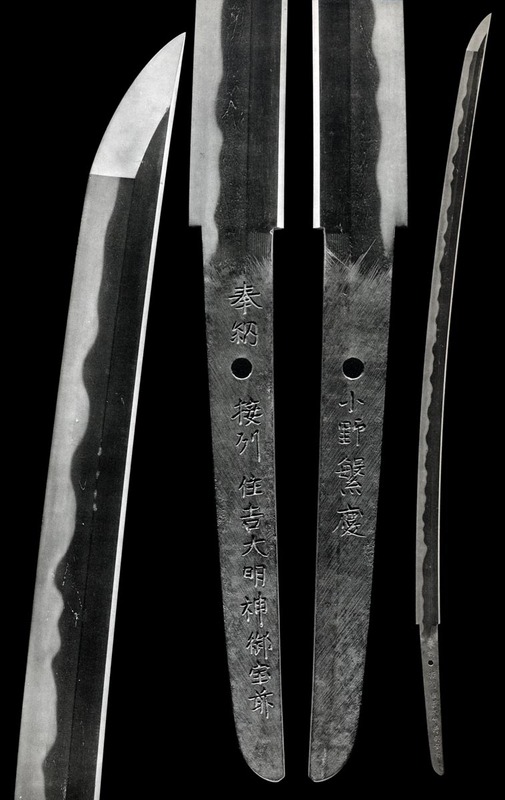 Very strong Shinogi-Tsukuri, Mitsu-Mune, shallow Sori to elongated Chu-Kissaki. Running O-Itame Hada strongly standing, rough and open, has strong Ji-Nie and Chikei. Gunome-Midare with Ashi and Yo in clear Nioi and Ara-Nie. Sunagashi and Kinsuji run through figures. Tachi-Omote Boshi is Sugu-Midare to Togariwith long fall Kaeri while Tachi-Ura is Notare-Komi Ko-Maru with Tobi-yaki. Ubu Yagengata Nakago has one Mekugi-ana. It is said, there are only five known examples. 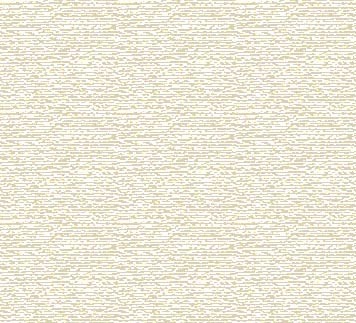 Mokume Hada has Ji-Nie and Chikei. Asaki-Notare Midare Ba is a running Sunagashi of Nijuba and Hotsure. Tobi-yaki and Yubashiri. Mune-yaki falls into the mid. Boshi is Sunagashi and Hakikake along the Fukura. A pointed Yagengata Ubu Nakago has two Mekugi-ana.